I hands down declare Asparagus and Mascarpone Gratin the most decadent, divine, delicious asparagus dish I’ve ever tasted! AND it’s fabulously easy. 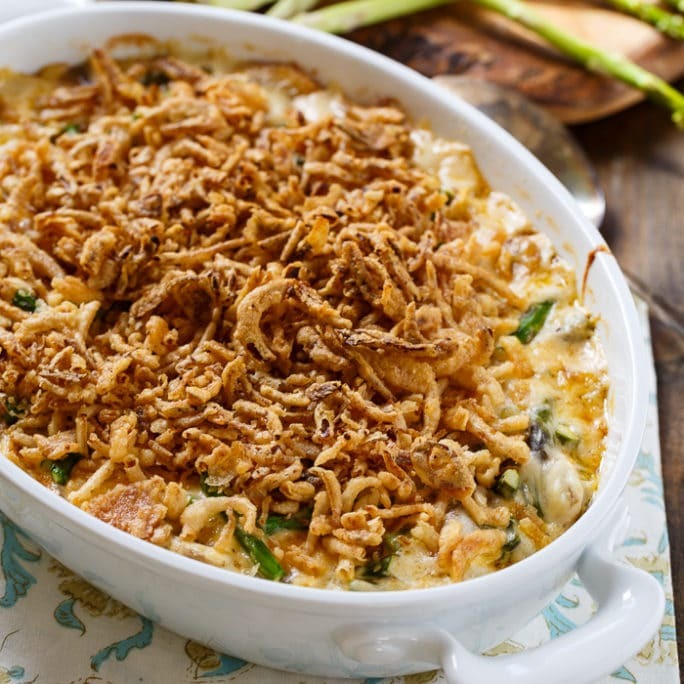 You might not even need to do dishes after cooking it beacause you’re going to want to eat it directly out of the casserole dish. No time can be wasted when something is this good. This is the first time I’ve cooked with mascarpone. Let me just tell you that I have a recipe for Strawberry Tiramisu using mascarpone in my recipe pile and that baby is going straight to the top of the pile. I’ve got to have me some more of that stuff. 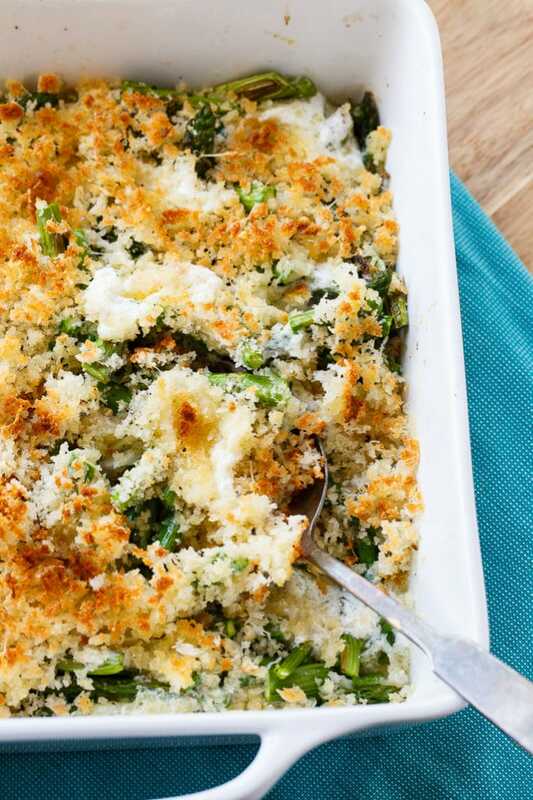 The mascarpone cheese makes for a fabulously creamy casserole and homemade breadcrumbs give the casserole a little crunch. I find my mind wandering at odd times of the day, contemplating all the ways I could use mascarpone. In an omelet, on pasta, stuffed in a chicken breast, a burger maybe?, in double-stuffed potatoes, deviled eggs, maybe even chicken salad. Yep, I’m pretty sure it would be good in just about anything. Have you ever cooked with mascarpone cheese before? What’s your favorite way to use it? 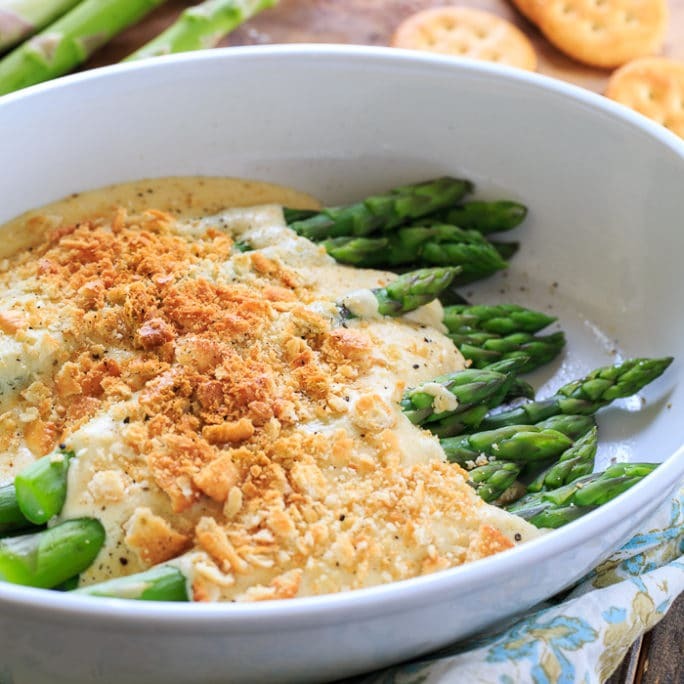 Asparagus and Mascarpone Gratin is the most decadent, divine, delicious asparagus dish ever. 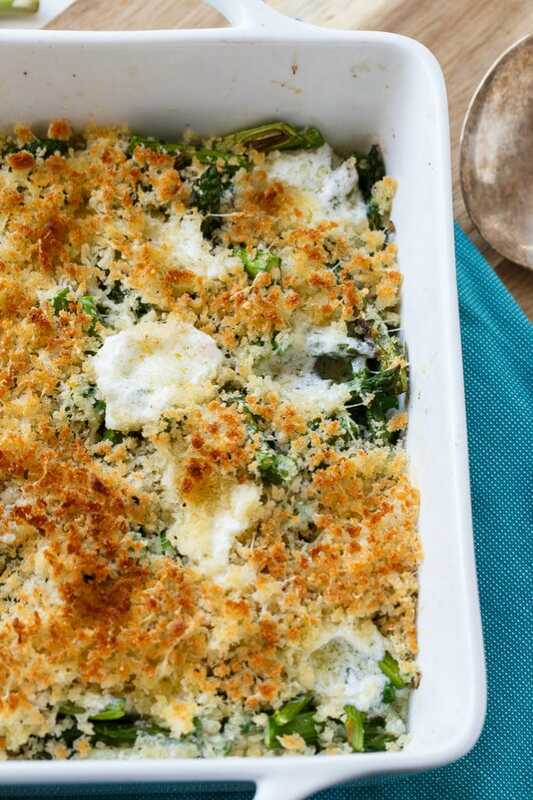 Mascarpone cheese makes the gratin super creamy and rich. Place oven rack 6 inches from broiler and heat broiler on high. 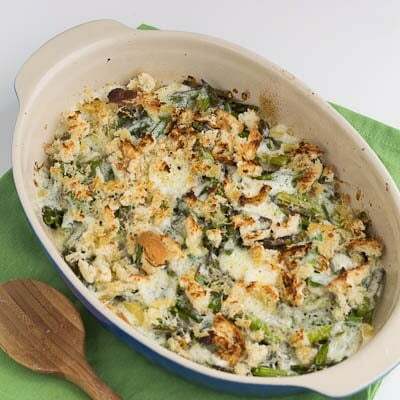 In a 2-quart gratin dish, toss together the asparagus, onion, 1/2 tablespoon olive oil. 1/2 teaspoon salt, and 1/8 teaspoon pepper. Broil until crisp-tender, about 6 minutes. In a medium bowl, toss together bread crumbs, Parmesan cheese, 1 tablespoon olive oil, and 1/8 teaspoon pepper. Remove asparagus from oven and dollop mascarpone in little spoonfuls over asparagus. Sprinkle with nutmeg and top with breadcrumb mixture. Broil until bubbly and golden brown, about 2 minutes. This entry was posted in Side Dishes and tagged asparagus, gratin, mascarpone. Bookmark the permalink. Mascarpone and NO DISHES??? Ummm best news ever. I haven’t cooked with mascarpone. This dish definitely will have me putting it on my list. Asparagus is so fresh right about now too. Off to the farmer’s market tomorrow! I rarely cook with mascarpone cheese even though I am always tempted to buy it in the store. The only recipe I used it in was for creamed polenta. This vegetable side dish looks so wonderful I just pinned it!